A demonstration of EDM’s ambience and beauty. 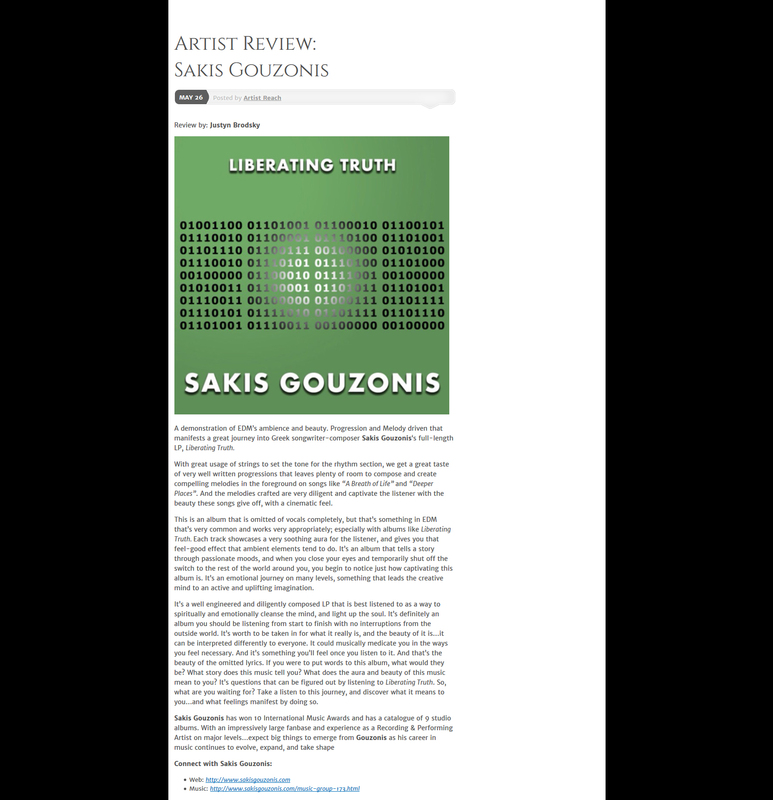 Progression and melody driven that manifests a great journey into Greek songwriter-composer Sakis Gouzonis‘s full-length LP, Liberating Truth. With great usage of strings to set the tone for the rhythm section, we get a great taste of very well written progressions that leaves plenty of room to compose and create compelling melodies in the foreground on songs like “A Breath of Life” and “Deeper Places”. And the melodies crafted are very diligent and captivate the listener with the beauty these songs give off, with a cinematic feel. This is an album that is omitted of vocals completely, but that’s something in EDM that’s very common and works very appropriately; especially with albums like Liberating Truth. Each track showcases a very soothing aura for the listener, and gives you that feel-good effect that ambient elements tend to do. It’s an album that tells a story through passionate moods, and when you close your eyes and temporarily shut off the switch to the rest of the world around you, you begin to notice just how captivating this album is. It’s an emotional journey on many levels, something that leads the creative mind to an active and uplifting imagination. It’s a well engineered and diligently composed LP that is best listened to as a way to spiritually and emotionally cleanse the mind, and light up the soul. It’s definitely an album you should be listening from start to finish with no interruptions from the outside world. It’s worth to be taken in for what it really is, and the beauty of it is… it can be interpreted differently to everyone. It could musically medicate you in the ways you feel necessary. And it’s something you’ll feel once you listen to it. And that’s the beauty of the omitted lyrics. If you were to put words to this album, what would they be? What story does this music tell you? What does the aura and beauty of this music mean to you? It’s questions that can be figured out by listening to Liberating Truth. So, what are you waiting for? Take a listen to this journey, and discover what it means to you… and what feelings manifest by doing so. Sakis Gouzonis has won 10 International Music Awards and has a catalogue of 9 studio albums. With an impressively large fanbase and experience as a Recording & Performing Artist on major levels… expect big things to emerge from Gouzonis as his career in music continues to evolve, expand, and take shape. Sakis Gouzonis is a multi-award winning composer with a truly eclectic approach to his song-writing and musicality. His songs are known to be very emotional and deep, connecting with listeners on a personal level through beautiful sonic tapestry and moving cinematic atmosphere. His songs are what you would expect to hear within the soundtrack from a truly epic movie, accompanying and complementing beautiful imagery in a very special way; it’s like a journey through sound. His recent album, “Liberating Truth”, is a collection of free tracks that are available to the public for non-commercial use (although it is possible to contact the artist for other uses). Sakis set out to develop a textural and vivid blend of sound that transcends melodies, harmonies and standard music characteristics. With the above statement, I mean that this isn’t just music made “for the sake of music” – it is actually material that’s meant to inspire the listener in a very vivid and visual way. 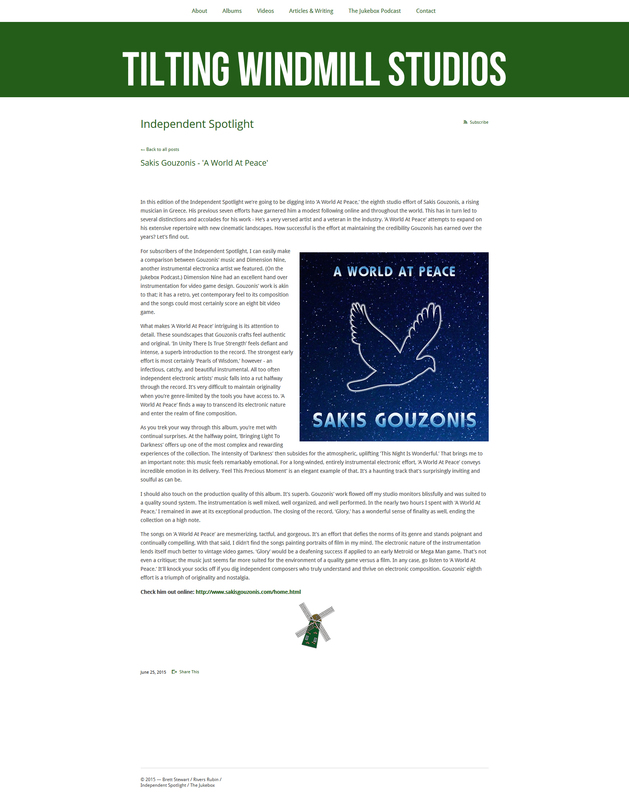 In this edition of the Independent Spotlight we’re going to be digging into ‘A World At Peace,’ the eighth studio effort of Sakis Gouzonis, a rising musician in Greece. His previous seven efforts have garnered him a modest following online and throughout the world. This has in turn led to several distinctions and accolades for his work – He’s a very versed artist and a veteran in the industry. ‘A World At Peace’ attempts to expand on his extensive repertoire with new cinematic landscapes. How successful is the effort at maintaining the credibility Gouzonis has earned over the years? Let’s find out. 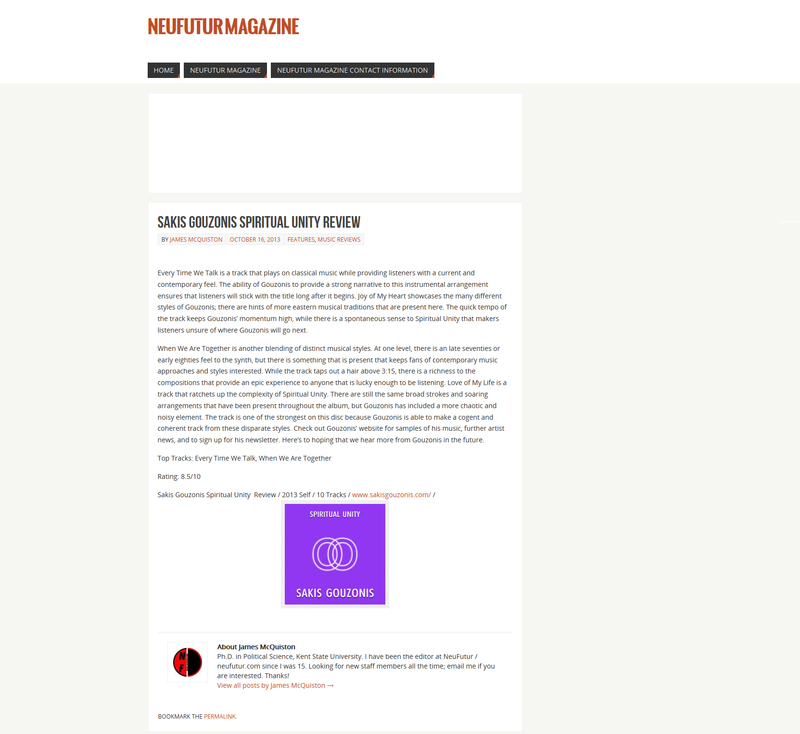 For subscribers of the Independent Spotlight, I can easily make a comparison between Gouzonis’ music and Dimension Nine, another instrumental electronica artist we featured. (On the Jukebox Podcast.) Dimension Nine had an excellent hand over instrumentation for video game design. Gouzonis’ work is akin to that; it has a retro, yet contemporary feel to its composition and the songs could most certainly score an eight bit video game. What makes ‘A World At Peace’ intriguing is its attention to detail. These soundscapes that Gouzonis crafts feel authentic and original. ‘In Unity There Is True Strength’ feels defiant and intense, a superb introduction to the record. The strongest early effort is most certainly ‘Pearls of Wisdom,’ however – an infectious, catchy, and beautiful instrumental. All too often independent electronic artists’ music falls into a rut halfway through the record. It’s very difficult to maintain originality when you’re genre-limited by the tools you have access to. ‘A World At Peace’ finds a way to transcend its electronic nature and enter the realm of fine composition. As you trek your way through this album, you’re met with continual surprises. At the halfway point, ‘Bringing Light To Darkness’ offers up one of the most complex and rewarding experiences of the collection. The intensity of ‘Darkness’ then subsides for the atmospheric, uplifting ‘This Night Is Wonderful.’ That brings me to an important note: this music feels remarkably emotional. For a long-winded, entirely instrumental electronic effort, ‘A World At Peace’ conveys incredible emotion in its delivery. ‘Feel This Precious Moment’ is an elegant example of that. It’s a haunting track that’s surprisingly inviting and soulful as can be. I should also touch on the production quality of this album. It’s superb. Gouzonis’ work flowed off my studio monitors blissfully and was suited to a quality sound system. The instrumentation is well mixed, well organized, and well performed. In the nearly two hours I spent with ‘A World At Peace,’ I remained in awe at its exceptional production. The closing of the record, ‘Glory,’ has a wonderful sense of finality as well, ending the collection on a high note. The songs on ‘A World At Peace’ are mesmerizing, tactful, and gorgeous. It’s an effort that defies the norms of its genre and stands poignant and continually compelling. With that said, I didn’t find the songs painting portraits of film in my mind. The electronic nature of the instrumentation lends itself much better to vintage video games. ‘Glory’ would be a deafening success if applied to an early Metroid or Mega Man game. That’s not even a critique; the music just seems far more suited for the environment of a quality game versus a film. In any case, go listen to ‘A World At Peace.’ It’ll knock your socks off if you dig independent composers who truly understand and thrive on electronic composition. Gouzonis’ eighth effort is a triumph of originality and nostalgia. 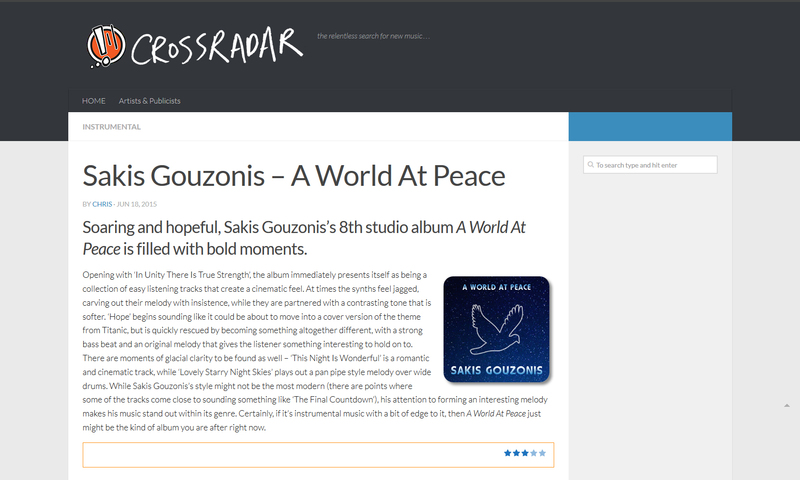 Soaring and hopeful, Sakis Gouzonis’s 8th studio album A World At Peace is filled with bold moments. Opening with ‘In Unity There Is True Strength,’ the album immediately presents itself as being a collection of easy listening tracks that create a cinematic feel. At times the synths feel jagged, carving out their melody with insistence, while they are partnered with a contrasting tone that is softer. ‘Hope’ begins sounding like it could be about to move into a cover version of the theme from Titanic, but is quickly rescued by becoming something altogether different, with a strong bass beat and an original melody that gives the listener something interesting to hold on to. There are moments of glacial clarity to be found as well – ‘This Night Is Wonderful’ is a romantic and cinematic track, while ‘Lovely Starry Night Skies’ plays out a pan pipe style melody over wide drums. While Sakis Gouzonis’s style might not be the most modern (there are points where some of the tracks come close to sounding something like ‘The Final Countdown’), his attention to forming an interesting melody makes his music stand out within its genre. Certainly, if it’s instrumental music with a bit of edge to it, then A World At Peace just might be the kind of album you are after right now. Golden Heart recalls the unusually light-hearted work of Jean-Jacques Perrey. Sakis Gouzonis fills his work with an unwavering sense of optimism. By carefully selecting the sound style and delivery the pieces have a timeless quality to them. Thanks to impeccable taste Sakis Gouzonis ensures that his music highlights the absolute best of early electronic music while also showing where it can go in the future. Every song fits into the last as Sakis Gouzonis ensures that his music does more than explore melody but helps to wordlessly tell a story. This sense of narrative helps to bind the many pieces together. For “The Power Of Your Love” Sakis Gouzonis opens the album up with a stately theme. “Higher And Further” displays a jaunty rhythm which propels the song forward. With a folk-like melody “On A Happy Sunday” is one of the highlights of the collection. On “To The One That I Love” the song feels tender as its delicate structure constantly sweeps ever upwards. Spreading things out a bit is the patient and restrained “More Than Words Can Say” whose many pieces come together to create a beautiful tapestry of sound. Moving into dance-friendly territory “Together Forever” positively shines. Golden Heart ends with the powerful “You Are My Strength”. Sakis Gouzonis displays the raw emotional power of electronic music with Golden Heart. Returning to the careful yet carefree sounds works wonders and shows exactly what is missing with so many electronic music arts today: heart and soul. Golden Heart plays almost like a forgotten soundtrack to a movie. Sakis Gouzonis more often referred to as Sakis, is a multi-award-winning, Greek composer, orchestrator, arranger, producer and performer of electronic music. His electronic music is based on the idea of taking the listener on a journey full of emotions, giving the listener a whole new experience. In addition, his electronic music defies all borders and speaks to people of all nations and cultures in a unique and powerful way. Over the last seven years, without having any assistance from record labels, Sakis Gouzonis has released 7 successful studio albums, he has won a total of 7 international music awards and 3 international distinctions, and he has gained more than 550,000 fans in 220 countries. 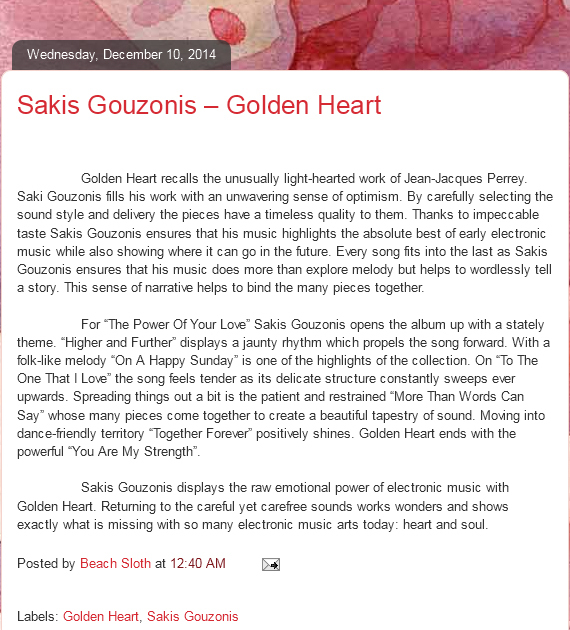 On 14 July 2014, Sakis Gouzonis released his 7th studio album titled Golden Heart in MP3 format. The album contains ten original tracks of electronic and cinematic music. All music tracks were composed, orchestrated, performed, recorded, mixed and mastered by Sakis Gouzonis in his recording studio located in Elassona, Greece. I found Golden Heart to be highly enjoyable, profoundly moving and emotionally stirring. Sakis has always the ability to make music sing; to take us on a musical journey that crescendos, then recedes, bending and pulsing as it fills the heart, even more than the mind. This music defies physics: time altogether seems to pass by slowly, but not dull. Far from it: every second is enjoyable! From the warm, celestial and uplifting textures of the opening “The Power Of Your Love” to the soothing, blissful and melodic “More Than Words Can Say,” and the rhythmic clockwork of “You Are My Strength,” as I listen to this music I truly feel as if I’m floating through atmospheres, dancing among the stars, and watching a divine interplay among the heavens. Sakis Gouzonis’ approach to electronically composed music is refreshing; given the rather stagnant nature such music has been in: either contemporary composers are selling us watered-down music in the traditional vein, or we’re being exposed to unnecessary technological avant-garde hybrids. It’s nice to hear some music by a gentleman who hasn’t got his head stuck in the clouds. Golden Heart plays almost like a forgotten soundtrack to a movie, making one wonder why Sakis doesn’t do more soundtrack work. Considering the success of his countryman and legendary peer, Vangelis, the possibilities seem endless for a similar talent. Overall the music on Golden Heart is crisp, ever changing, thoughtful and a delight to listen to. It has grand and rousing sections as well as sublime and profound passages. This is what music is supposed to be; Sakis Gouzonis gets into your very soul and enriches it! 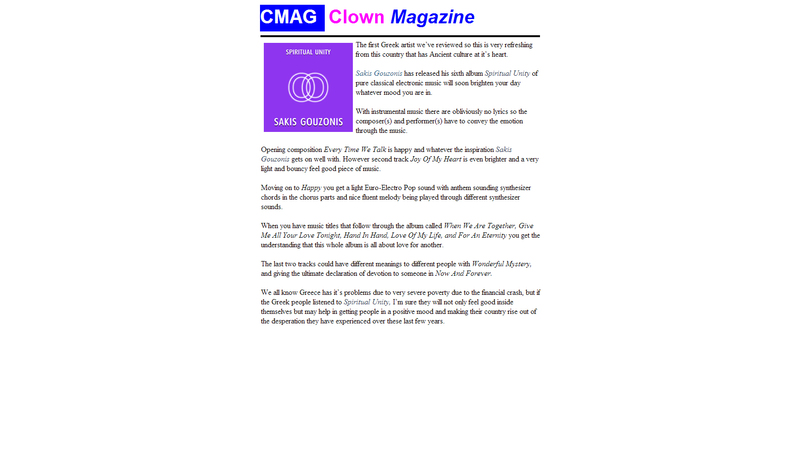 Sakis Gouzonis is a solo artist from Greece (who is usually just referred to as Sakis) has quite an impressive resume. He has won a total of seven international music awards and three international distinctions, and he has gained more than 450,000 registered listeners in 220 countries/territories. His music has been heard on radio and television and recommended by a number of media outlets. He just finished his sixth album entitled Spiritual Unity, which is an instrumental electronic album that touts ten decent original songs that use a similar palette. All the songs on the album feel quite grand as he chooses to embrace airy, near mystical sounding synths that create an ethereal atmosphere. In addition to this a lot of the songs have a Persian mystique that is combined with elements that make the songs danceable. The album begins with “Every Time We Talk,” which feels like it could be playing in the movie “Prince Of Persia” as Jake Gyllenhaal walks across the desert. Broad warms pads make their way across the song as an intricate lead part is played. The song is pleasant even though it never really leaves the comfortable landscape. “Joy Of My Heart” sounds like a traditional eastern European song played on a Juno-g while “When We Are Together” is another thematic song that sounds like a victorious ending to a battle. “Love Of My Life” is a slower number but still grandiose and sticks to the formula that creates a huge veil of warm mystical pads over some tinkering 16th notes. The album ends with a high-energy song with an increased BPM called “Now And Forever.” It utilizes a steady king drum and dramatic strokes to create an adrenaline inducing number. Throughout Spiritual Unity Gouzonis knows what works for him and utilizes it. This is by no means cutting edge electronic music but it has its moments. The music seems to be made for movies that want to be epic. Directors take note if you are reading. The first Greek artist we’ve reviewed so this is very refreshing from this country that has ancient culture at its heart. 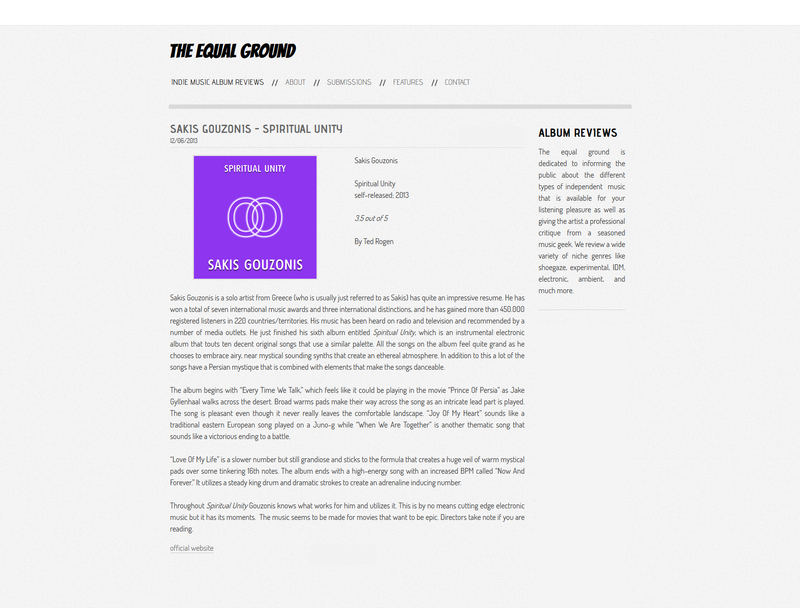 Sakis Gouzonis has released his sixth album Spiritual Unity of pure classical electronic music will soon brighten your day whatever mood you are in. With instrumental music there are obliviously no lyrics so the composer(s) and performer(s) have to convey the emotion through the music. Opening composition Every Time We Talk is happy and whatever the inspiration Sakis Gouzonis gets on well with. However second track Joy Of My Heart is even brighter and a very light and bouncy feel good piece of music. Moving on to Happy you get a light Euro-Electro Pop sound with anthem sounding synthesizer chords in the chorus parts and nice fluent melody being played through different synthesizer sounds. When you have music titles that follow through the album called When We Are Together, Give Me All Your Love Tonight, Hand In Hand, Love Of My Life, and For An Eternity you get the understanding that this whole album is all about love for another. The last two tracks could have different meanings to different people with Wonderful Mystery, and giving the ultimate declaration of devotion to someone in Now And Forever. We all know Greece has its problems due to very serve poverty due to the financial crash, but if the Greek people listened to Spiritual Unity, I’m sure they will not only feel good inside themselves but may help in getting people in a positive mood and making their country rise out of the desperation they have experienced over these last few years. Every Time We Talk is a track that plays on classical music while providing listeners with a current and contemporary feel. The ability of Gouzonis to provide a strong narrative to this instrumental arrangement ensures that listeners will stick with the title long after it begins. Joy Of My Heart showcases the many different styles of Gouzonis; there are hints of more eastern musical traditions that are present here. The quick tempo of the track keeps Gouzonis’ momentum high, while there is a spontaneous sense to Spiritual Unity that makes listeners unsure of where Gouzonis will go next. When We Are Together is another blending of distinct musical styles. At one level, there is a late seventies or early eighties feel to the synth, but there is something that is present that keeps fans of contemporary music approaches and styles interested. While the track taps out a hair above 3:15, there is a richness to the compositions that provide an epic experience to anyone that is lucky enough to be listening. Love Of My Life is a track that ratchets up the complexity of Spiritual Unity. There are still the same broad strokes and soaring arrangements that have been present throughout the album, but Gouzonis has included a more chaotic and noisy element. The track is one of the strongest on this disc because Gouzonis is able to make a cogent and coherent track from these disparate styles. Check out Gouzonis’ website for samples of his music, further artist news, and to sign up for his newsletter. Here’s to hoping that we hear more from Gouzonis in the future. A new album, a new artist to me and a new sound that is refreshing and yet strangely retro in style, Vast Victory is a breath of fresh air in a world of plastic coated manufactured pop. Now I Am Free literally explodes with a definite 80’s percussion feel and at times I kept expecting Bonnie Tyler to chip in with her dulcet tones. But the structure of this piece is well crafted and has the right emotional content and that content is sheer controlled power. Heavenly Light forms from its beginnings to an almost Jarre like level, but again the power and deep swirling Electronic vibes hold together a composition performed by an artist who seems to be able to pull the magical musical rabbit out of the hat at every touch of the keyboards. A man much decorated in the world of international music and rated to be the biggest export Greece has ever had, Gouzonis really brings this home with the composition Lead Me Home, a less in your face piece and very melodic with a definite cinematic made style this was easily one of my favourite compositions from the album. 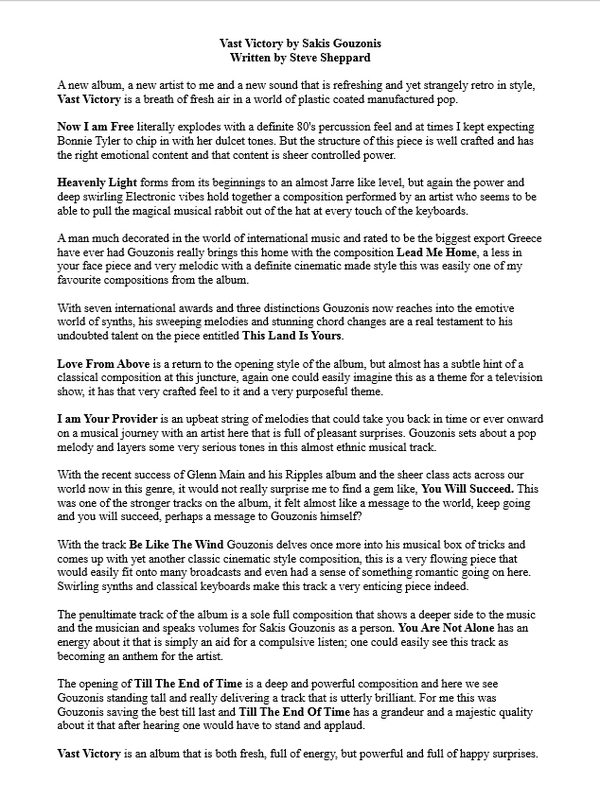 With seven international awards and three distinctions Gouzonis now reaches into the emotive world of synths, his sweeping melodies and stunning chord changes are a real testament to his undoubted talent on the piece entitled This Land Is Yours. Love From Above is a return to the opening style of the album, but almost has a subtle hint of a classical composition at this juncture, again one could easily imagine this as a theme for a television show, it has that very crafted feel to it and a very purposeful theme. I Am Your Provider is an upbeat string of melodies that could take you back in time or even onward on a musical journey with an artist here that is full of pleasant surprises. Gouzonis sets about a pop melody and layers some very serious tones in this almost ethnic musical track. With the recent success of Glenn Main and his Ripples album and the sheer class acts across our world now in this genre, it would not really surprise me to find a gem like You Will Succeed. This was one of the stronger tracks on the album, it felt almost like a message to the world, keep going and you will succeed, perhaps a message to Gouzonis himself? With the track Be Like The Wind, Gouzonis delves once more into his musical box of tricks and comes up with yet another classic cinematic style composition, this is a very flowing piece that would easily fit onto many broadcasts and even had a sense of something romantic going on here. Swirling synths and classical keyboards make this track a very enticing piece indeed. The penultimate track of the album is a sole full composition that shows a deeper side to the music and the musician, and speaks volumes for Sakis Gouzonis as a person. You Are Not Alone has an energy about it that is simply an aid for a compulsive listen; one could easily see this track as becoming an anthem for the artist. The opening of Till The End Of Time is a deep and powerful composition, and here we see Gouzonis standing tall and really delivering a track that is utterly brilliant. For me, this was Gouzonis saving the best till last, and Till The End Of Time has a grandeur and a majestic quality about it that after hearing one would have to stand and applaud. Vast Victory is an album that is both fresh, full of energy, but powerful and full of happy surprises.